At Backwoods Bridges we specialize in a method of construction known as "top down construction" which allows us to build without any heavy equipment ever touching the ground. This method greatly reduces disturbance to the natural environment and makes it possible to build in wetlands and other areas where it was previously very difficult to build. We specialize in building top-down constructed boardwalks. Our “top-down” bridge construction method allows us to build a 6 to 12 foot wide bridge or elevated boardwalk without any heavy equipment ever touching the ground. This method greatly reduces disturbance to the natural environment and makes it possible to build in wetland and other areas where it was previously very difficult to build. This method of building is extremely efficient and leaves you with a beautiful and long-lasting structure. We can also custom build vehicular bridges capable of supporting anything as small as golf carts to bridges big enough to support large vehicles up to 80,000 pounds. Below are pictures briefly showing the "top-down" construction process we used to build a 5-ton in-lake boardwalk in Casselberry, Florida. Material is fed utilizing the existing boardwalk. 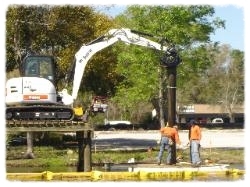 Piling are driven from the deck using a vibratory hammer. After the piling are driven to refusal, the pile are cut to elevation. The stringers are hooked up to the tractor and swung into place. The decking is hooked up, swung into place and fastened to stringers. Please click the link below to read Green Building & Design Magazines featured article about us and our top down method of construction.